*Major repairs needed includes dwellings needing major repairs such as dwellings with defective plumbing or electrical wiring and dwellings needing structural repairs to walls, floors or ceilings. Indigenous identity’ includes persons who are First Nations (North American Indian), Métis or Inuk (Inuit) and/or those who are Registered or Treaty Indians (that is, registered under the Indian Act of Canada) and/or those who have membership in a First Nation or Indian band. Indigenous peoples of Canada are defined in the Constitution Act, 1982, section 35 (2) as including the Indian, Inuit and Métis peoples of Canada. Source: Statistics Canada – 2016 Census. Catalogue Number 98-400-X2016164. http://www12.statcan.gc.ca/census-recensement/2016/dp-pd/dt-td/Rp-eng.cfm?TABID=2&LANG=E&A=R&APATH=3&DETAIL=0&DIM=0&FL=A&FREE=0&GC=01&GL=-1&GID=1341679&GK=1&GRP=1&O=D&PID=110519&PRID=10&PTYPE=109445&S=0&SHOWALL=0&SUB=0&Temporal=2017&THEME=122&VID=0&VNAMEE=&VNAMEF=&D1=0&D2=0&D3=1&D4=0&D5=0&D6=0 -accessed December 23, 2017. In 2016, 26.1% of First Nations children under 15 lived in housing in need of major repair. That was the case for 11.9% of Métis children under 15 and 27.0% of Inuit children under 15. 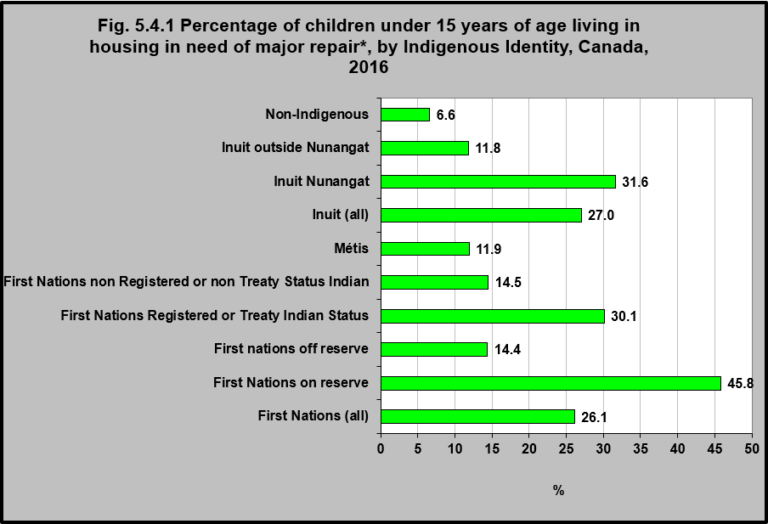 First Nations children with Registered or Treaty Indian Status were more likely to live in housing in need of major repair (30.1%) than were those without status (14.5%). Inuit children living in Inuit Nunangat were more likely to live in housing in need of major repair (31.6%) than were those living outside Nunangat (11.8%). Non-Indigenous children under age 15 were the least likely to live in housing in need of major repair (6.6%). 1National Collaborating Centre for Aboriginal Health. (2016). Housing as a determinant of First Nations, Inuit and Métis health. Prince George, BC: Author. 3OHTN Rapid Response Service. (2011). Review: Impact of housing status and supportive housing on the health of Aboriginal people. Toronto, ON: Ontario HIV Treatment Network. 4George, M.A., Brussoni, M., Jin, A., Lalonde, C.E., & McCormick, R. (2016). Ecological analyses of the associations between injury risk and socioeconomic status, geography and Aboriginal ethnicity in British Columbia, Canada. Springer Open, 5, 567, DOI: 10.1186/s40064-016-2262-x; Kohen, D.E., Bougie, E., & Guèvremont, A. (2015). Housing and health among Inuit children. Health Reports, 26(11), 21-27.